NO one has to educate this investigative journalist on the ins and outs of Islam and the “radicalization” process which leads to jihad. Ain’t that the truth. SO take it to (mental) vault when this claim is asserted: New York City’s security net has taken a dangerous nosedive, ever since a chief radical revolutionary, Bill DeBlasio, took over the Mayoral helm. In fact, it took less than a New York minute for him to dispatch the NYPD’s top gun Police Commissioner, Ray Kelly, an “out-of-the-box” leader and counter terror expert, and to replace him with a malleable surrogate, William Bratton. Rest assured, this is the case even though Bratton served as top cop under Giuliani and Dinkins. The fact is that Bratton wouldn’t have been appointed, if he hadn’t agreed to gut the most effective counter terror tools, bar none, developed by Ray Kelly. Believe it. An NYPD unit tasked with spying on the city’s Muslims was publicly killed Tuesday, just days after a ruling that upheld its legal basis. So what gives? New York is the country’s largest city and one of its most progressive but since 2001 it’s also been at the forefront of some of the most aggressive and controversial anti-terrorism tactics. Yesterday, city officials announced the end of one of those major tactics: targeted spying on Muslim communities.But there’s some strange timing going on here. For one thing, New York’s liberal Mayor Bill de Blasio was in favor of the surveillance program before he was against it. Then there’s the fact that just days after the New York Times reported that Attorney General Eric Holder will sign off on new guidelines for the FBI that would allow it to continue using nationality to map and surveil neighborhoods, the NYPD program that had been assembling detailed files on Muslim neighborhoods is being publicly dismantled.More on that in a bit, first some background on the program itself.Officially, the spying was done under the auspices of the NYPD’s “Zone Assessment Unit.” Muslims in New York City saw their mosques, restaurants and, in some cases, student associations infiltrated by undercover NYPD officials and confidential informants who took notes on overheard conversations, television programs that were playing, nationality of store owners and customers, and anything else that NYPD officials thought gave them a flavor for what was happening in the city’s cloistered immigrant communities that catered to Muslims from the Middle East, North Africa and Eastern Europe. BUT to understand why this “touchy” subject hits to the core, its particular resonance comes from being a native New Yorker (notwithstanding other related matters), though currently living in Israel. REGARDLESS, some high level professional contacts keep tabs on evolving dangers. Alas, not too much escapes certain finely tuned eyes and ears. Thus, the notion that De Blasio is endangering New York City, America as a whole, is untenable. Not only that, essentially, his pro jihad actions invariably blow back onto Israel and that is a fact . DUE to the above, this is precisely why it was incumbent to jump into the fray, when two of the NYPD’s finest were assassinated, execution style, in Bed-Stuy. As a tidbit, Bed-Stuy houses one of New York City’s most Islamic infested enclaves, for that matter, one of the most jacked up terror nests in the U.S. Yes, this ‘nabe bears close watching, and then some. AS a matter of jihadi record, Masjid At-Taqwa boasts a “star” player in the hierarchy of the terror arena. And this is why he has been featured, more than once, at this site – Siraj Wahhaj! THE notion that any NYC Mayor would cease surveillance within said Islamic infused areas, well, bespeaks of nothing less than supporting the plotting and execution of terror attacks within NYC, and beyond its borders. Like night follows day. In top-secret talks to settle federal lawsuits against the NYPD for monitoring mosques, the city is weighing a demand that it scrub from its Web site a report on Islamic terrorists, The Post has learned. The groundbreaking, 92-page report, titled “Radicalization in the West: The Homegrown Threat,” angers critics who say it promotes “religious profiling” and discrimination against Muslims. But law-enforcement sources say removing the report now would come at the worst time — after mounting terror attacks by Islamic extremists in Paris, Boston, Sydney and Ottawa. Here in New York, Zale Thompson, a man who heeded online calls by ISIS for jihad, attacked two NYPD officers with a hatchet in October. Sources familiar with the case confirmed that removal of the NYPD report is one of the major sticking points in settlement negotiations. Also on the table are demands that the NYPD halt any ongoing surveillance in the Muslim community and that records of prior monitoring be expunged, sources said. With what seems today like a crystal ball, the 2007 NYPD report identified an “emerging threat” — al Qaeda-inspired jihadists in the United States and abroad, hell-bent on attacking their host countries. Most terrorist wannabes are reasonably well-educated male Muslims between ages 18 and 35, local residents, second- or third-generation with roots in the Middle East or South Asia, and from middle-class families. Under former Police Commissioner Ray Kelly, the report served as a blueprint for the NYPD’s “demographic unit,” which sent plainclothes detectives into Muslim cafes, stores and mosques to detect potential terrorists. The suits complain the radicalization report puts virtually all Muslims under suspicion. Last April, Police Commissioner Bill Bratton disbanded the intelligence-gathering unit. YET, if any of the above appears out of left field – no pun intended – consider the fact that Comrade DeBlasio and Barack HUSSEIN Obama are absolute kindred spirits, both red and green imbued and aligned. Anti-Americans to their core. Therefore, the following video link is of piece with an Islamist-in-Chief, one who exhorted on September 21, 2014: America is the Number One Muslim country in the world! KNOW this: the counter terrorism unit which Ray Kelly birthed, conceived and developed has been the main reason why NYC hasn’t suffered another 9/11/01. And those who argue otherwise do not know what they are babbling about. Trust this info. Not only that, it is not a politically biased statement, but one borne out of a host of knowledge-based material. Readers may also want to “sit in” on a bird’s eye view of what had been regular briefings, under the stellar command of Ray Kelly. AND if folks truly want to know what’s what, you must internalize – pass along too – the following report, and then extrapolate its findings from NYC to ANY city USA! ON the other hand, those reporting to Bratton, regarding Islamic threats, are working akin to a game of blind man’s bluff. How so? 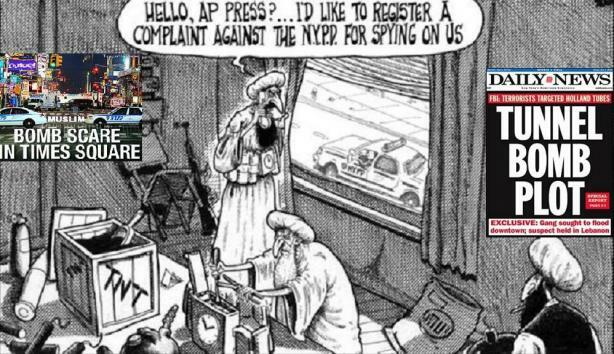 Since the so-called Islamic-based “spying” is no longer on the table; and the most comprehensive, fact based analysis compiled by the NYPD’s counterterrorism intelligence division is on the chopping block, well, how do you think the security situation (NYC’s and America’s) is going to be affected, positively or negatively? This entry was posted in Uncategorized and tagged http://islamexposed.org/2015/01/22/nypds-counterterrorism-unit-gutted-islamic-jihad-report-offensive-to-followers-of-islam-the-blow-backcommentary-by-adina-kutnicki/, http://joeforamerica.com/2015/01/nypds-counterterrorism-unit-gutted-islamic-jihad-report-offensive-followers-islam-blow-back/, https://www1.nyc.gov/html/nypd/downloads/pdf/public_information/NYPD_Report-Radicalization_in_the_West.pdf, Islam and the "radicalization" process, Masjid At-Taqwa, NYPD counterterrorism unit, NYPD intelligence regular briefings, NYPD's counterterrorism intelligence division, NYPD's finest, Ray Kelly, Siraj Wahhaj by Adina Kutnicki. Bookmark the permalink. Awesome as always, Adina! Emailing to other contacts. Damning, compelling but, sadly not surprising! Sharing with email contacts. Pingback: Israel's Voice | NYC Commie Mayor: Islamic Cops TOP RECRUITING Priority! To What End? Pingback: Israel's Voice | Islam Surging & Sunni & Shia Align. NYPD Prostrates to Allah-Again! Where is the Nexus? Pingback: Israel's Voice | U.S. Mosques MUST Be Dismantled; A Cancerous Scourge. Saving America By Removing Omertas.